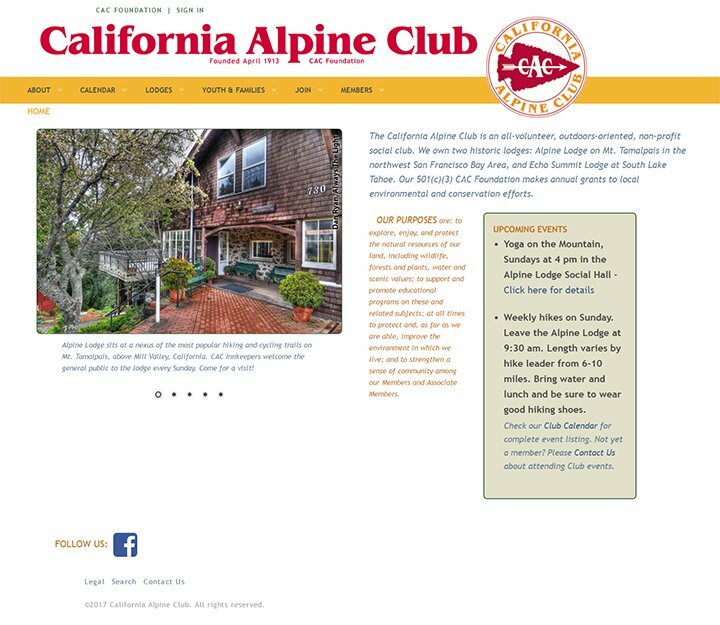 California Alpine Club (CAC) is a nonprofit, outdoors-oriented, social club whose purpose is to explore, enjoy and protect the natural resources of our land. The California Alpine Club Foundation (CACF), founded by the CAC, supports the conservation and environmental education endeavors of SF Bay Area and Lake Tahoe area organizations. The new CAC/CACF website was designed to reflect their 100+ years of tradition and their ongoing activities. In this redesign, content was expanded to present CAC’s long history, giving users a larger picture of the organization. Development of the site included coding a variety of templates, with and without sidebars, with featured photos or with image sliders, to present this content. Customized content areas were created in the front page template to enable the client to update site content without the need of specialized coding knowledge. The client also required a members-only section to display member information and store archives for members’ eyes only. The members home page includes excepts of recent members’ blog posts, coded to feed automatically from the blog. An events calendar was created with members-only view and a public view. The members-only view displays all event information, while the public view presents the event name, date, time, and description as well as the individual organizer’s name and email address. With two views, the public can get a clear sense of the events that organization is producing on a regular basis, while specific event and member information is protected. The entire site uses responsive design, which is especially important for this organization’s members who’ll need to access the site from a variety of devices. All site contents reformat to optimal views for tablets and smartphones.